The first time I saw devotees of Krsna was in 1970 while visiting Vancouver. One day I noticed three or four shaven-headed monks walking quickly towards an unknown destination. Wherever they were going, they certainly looked exotic. One of the monks was carrying what appeared to be a sitar (but probably a tamboura), and I gave them a long second look before they disappeared around the corner. A year later, I was attending high school in Winnipeg, Manitoba (often described as a Godforsaken place). Aside from regular studies and homework, I was searching for answers to the bigger questions in life: "Who am I? Why am I here? What is the meaning of life?" etc. In pursuit of understanding these mysteries, I began reading many books. My search led me through the regular gamut of Western philosophy, poetry and literature. Yet something was still lacking, so I turned to the East and its renowned spiritual wisdom. On a cold winter night (for which Winnipeg is world famous), I decided to brave a blistering snowstorm and visit my favorite bookstore downtown. Maybe I could find some ancient knowledge there. After searching through rows of books, I decided upon the Penguin Classic version of the Upanisads. It was slim and attractive. Perhaps all truths could be found in one book. I remember hoping so because I was getting tired of reading so many books, only to be disappointed. As I went downstairs with new book in hand, I exited through the corner lobby of the building. My heart stopped when I opened the door. There, in the foyer, was a bald-headed monk in saffron robes offering books to each passerby. "Hare Krsna, Hare Krsna," he said to everyone. The entire room smelled like incense. Struck with wonder, I retreated and went back into the bookstore so that I could gaze at him through the glass window. This was unbelievable. Dressed in only the thinnest of cotton robes on one of the coldest nights of the year, he seemed unperturbed and totally determined in his mission. He approached everyone, but hardly anyone stopped. Most of the people rushing in to escape the harsh weather outside probably thought he was completely mad. After I had finally gathered up enough nerve (about half an hour later), I timidly approached him. Oddly, he didn't say hello or offer a greeting. Instead, he just announced to me with deep conviction in his voice: "Our spiritual master said that we should eat less and sleep less." Taken aback, I mumbled something in agreement. After exchanging a few words, he asked me what I had in my bag. I told him it was the Upanisads, thinking that it might impress him. "That's not authorized," he said. "Real knowledge must be received from a bona fide spiritual master in disciplic succession from God Himself." He then instructed me to take the book back, get a refund and buy one from him. Somehow or other, I agreed once again. When I returned, he pulled out a copy of Sri Isopanisad by His Divine Grace A.C. Bhaktivedanta Swami Prabhupada, Founder-Acarya of the International Society for Krsna Consciousness. He handed it to me and asked for a donation. I gave him two dollars. The book was beautiful and its pages were fragrant from the bag of incense he carried in his bag. I was happy with my purchase and our brief exchange, and eagerly left for home to read the new book. That night I couldn't sleep. I stayed up reading what immediately struck me as a rare discovery of celestial knowledge. I drank every word as if they were drops of divine nectar, and I couldn't put the book down. The feeling that I had then was unlike anything I had ever experienced while reading other books. As I read Srila Prabhupada's words and gazed at his picture on the back cover, I was convinced that he was a bona fide spiritual master. At long last, I had finally reached the end of my quest. The next morning, I tried to find the devotee who sold me the book, but he was nowhere to be found. Disappointed, I went to another bookstore to see if it might stock any books from the same author on its shelves. I was thrilled to discover a thick paperback entitled Bhagavad-gita As It Is, complete with Sanskrit verses, English translations and Bhaktivedanta purports. I think it cost $4.95. That book became my Bible, and I carried it everywhere during my last year of high school. I also began corresponding with the secretary in Los Angeles listed on the inside of the book. After making a small altar in my room, I ordered some more books and a set of chanting beads. For the next year, my spiritual life began to blossom, and it was one of the happiest times of my life. After finishing high school, I decided to join Prabhupada's movement, and so I traveled back to Vancouver to join the temple there. Only days later, I was fortunate to be sitting at Prabhupada's feet as he performed a fire sacrifice in the L.A. temple room. Less than a year after that, I was standing near Srila Prabhupada in Golden Gate Park (San Francisco) when the above photo was taken. Hundreds of Godbrothers and Godsisters were celebrating there together along with 10,000 blissful participants. 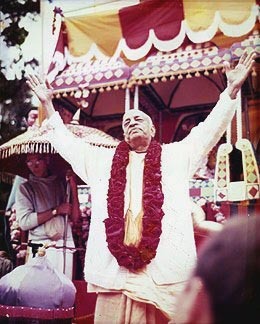 The long arms of Prabhupada's mercy had stretched all the way to Winnipeg, Canada -- and had saved yet another lost soul.